Da Capo Lifelong Books, 9780738219608, 256pp. Julie Rosenberg, MD, is a physician executive who has worked in a variety of leadership roles in the pharmaceutical industry. She has actively practiced yoga for more than fifteen years and has completed both 200-hour and 500-hour teacher trainings. Dr. Rosenberg teaches yoga primarily "beyond the mat," helping individuals and groups to apply the principles and practice of yoga to their daily lives and to support their overall health and well-being, to achieve success, and to become more effective leaders. She lives in Connecticut and Florida. Find out more on the web at www.julierosenbergmd.com. "Let Julie Rosenberg take you Beyond the Mat, where you can breathe, focus, and balance your way to a healthier and happier you--and be a better leader while you're at it!" "Julie Rosenberg speaks with an authentic and passionate voice about the holistic benefits of a yoga, meditation, and mindfulness practice. Taking the practice 'beyond the mat' using a practical and readily available framework will help you to lead and to live with stability, presence, clarity, and focus. Beyond the Mat is a must for anyone seeking peace and joy in life." "Many of us are struggling with busyness, stress, and exhaustion in the face of our over-burdening lives and over-demanding roles. What Julie Rosenberg does beautifully in this book is to apply the ancient wisdom of yoga to the modern challenges of twenty-first-century life and work. This book is both practical and profound. It's like a new set of glasses: it helps you to see familiar problems a bit differently, a bit more clearly. It also provides a host of simple techniques and tools to respond more effectively. For anyone who has found mindfulness useful, this book is a must; it will help you extend your mindfulness through your body, life, and leadership." "It is time for a book like this one! Julie Rosenberg is an authentic voice for the integration of yoga philosophy and leadership skills. Her personal experience in yoga and corporate America, upfront honesty, and practicality combine to create a book that is as useful as it is inspirational." "Dr. Rosenberg combines the rare talents of advanced medical training and practice, leadership in a high pressure industry, and hundreds of hours of training in yoga and meditation to share with us the 'special sauce' and power of success: a practice of yoga combining mind, body and spirit. Her tools, even as simple as twisting in your chair purposefully at work, will enhance your life and will be used to coach my patients in my clinic." "Dr. Rosenberg's book examines the internal process of improving mindfulness through the principles and practices of yoga. As someone who has gained great insight through my own practice of mindfulness, the concepts and ideas outlined in this book are highly relevant to anyone working to achieve greater focus, presence, and enlightened leadership." "Dr. Rosenberg has the courage to make the connections between mind, body, productivity, and authenticity. In a cynical world full of self-doubt and fear of the future, Rosenberg presents a way through the commotion and noise that is practical, applicable, and designed to allow us to live more congruent, purposeful lives. It's one thing to talk in platitudes. It's another thing to embrace an approach which increases the probability that we will live the kind of lives that we dream about." "Dr. Julie Rosenberg's Beyond the Mat urges readers to use yoga to improve their lives, in and beyond the workplace, and demonstrates the potential power of yoga to transform lives, systems, and organizations. The book is an important contribution to a body of literature that celebrates and cultivates compassion, kindness, and empathy." "With a lovely candor and pragmatism, Julie Rosenberg explores how applying yoga practices can transform both the personal and corporate landscape. Read Beyond the Mat for insight into essential yogic principles, as well as simple and inspiring lessons on how to integrate them into daily life. A vital contribution for anyone trying to bring their best self into the workplace." "Beyond the Mat serves as a compass for leaders to work and breathe with purpose beyond traditional markers of success. Weaving between easy step-by-step handbook and stories of real-life experiences, Julie Rosenberg offers both path and parable for anyone who hopes to lead by service and clarity of vision and intention. This wonderful book provides a chance to detach from the distractions of 'business book,' a leadership and anchor to the precepts of human leadership. Beyond the Mat is my new desktop companion and I am certain it will serve my company, my employees, and me quite well." "Offering easily accessible and concise practices for body and mind, Julie Rosenberg captures the depth and wisdom of ancient yoga in the every-day tools she presents in Beyond the Mat. I am always on the hunt for a book that inspires both me and my students--Dr. Rosenberg gives everyone the tools necessary to walk through personal and professional life with embodiment, peace, and precision." 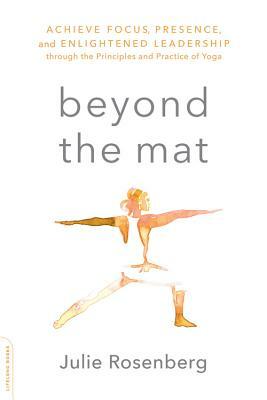 "Beyond the Mat unrolls the red carpet of yoga in front of the reader--it demystifies yoga and makes the practices of mindfulness, pranayama, and asanas accessible to every reader. Dr. Julie Rosenberg shares her personal experience as to how practicing these techniques can help with stress management, job performance, and personal satisfaction. Everyone wants to feel good, and to feel good about themselves. Beyond the Mat offers a sound practice of how to achieve both." "Full of user-friendly tools that make yoga accessible for even the busiest and most skeptical, Julie Rosenberg's Beyond the Mat is an intelligent and easy-to-read practical guide to life for everyone. Julie's own personal journey and experience offer a captivating backdrop and give her words of wisdom great credence. Inspiring!" "Beyond the Mat achieves something more important than hope and more practical than inspiration: with every page it demonstrates the concrete, life-changing efficacy of yoga and meditation. This timely book shows us how to become the dynamic and positively impactful leaders we want to be, and the world needs us to be, one breath and one moment at a time." "Dr. Rosenberg has done an excellent job combining the hard science of the medical profession with the soft science of mindfulness in a beautiful way. The messages offer insights that, when practiced, will lead to a healthier life--mentally, physically, emotionally, and spiritually." "Bravo! Dr. Julie Rosenberg beautifully articulates the vast, complex benefits of the yoga practice in a way that is consumable and deeply relevant to the modern, fast-paced lifestyle that challenges so many of us on a daily basis." "Powerful and important. When businesses bring yoga into the workplace, they usually do so to improve team wellness. Dr. Rosenberg's convincing and important book shows that they should also do so to improve team leadership. A necessary read for the corporate and business world." "An insightful reminder that yoga has so much more to offer than just poses. Beyond the Mat offers a powerful journey of holistic leadership principles by walking the reader through the eight limbs of Ashtanga and how they relate to enlightened leadership and personal transformation. An excellent read for all."